Not so long ago, compact coastal cruisers usually provided cramped quarters and minimal comfort, but the new Hunter 27 is cut from an entirely different mold. It’s only 27 feet long, but its 6 feet, 2 inches of headroom and nearly 10 feet of beam provide enough internal volume for cruising amenities not often found on 27-foot boats. Being able to stand up down below is only the beginning. This Hunter has an aft cabin equipped with a double bunk, a hanging locker, and enough room to stand up and change your clothes. There’s room for two more in the V-berth. The head compartment fully encloses a portable toilet and built-in vanity and mirror. The galley has a single-burner stove, a stainless sink, and a clever locker designed to accommodate a portable 40-quart cooler. Six adults can sit comfortably around the saloon table, which drops down to form a bunk, and there is a small aft-facing nav table. If the standard features don’t provide enough cruising conveniences, options include pressurized hot and cold water, a marine head and shower, and, of course, a microwave oven. 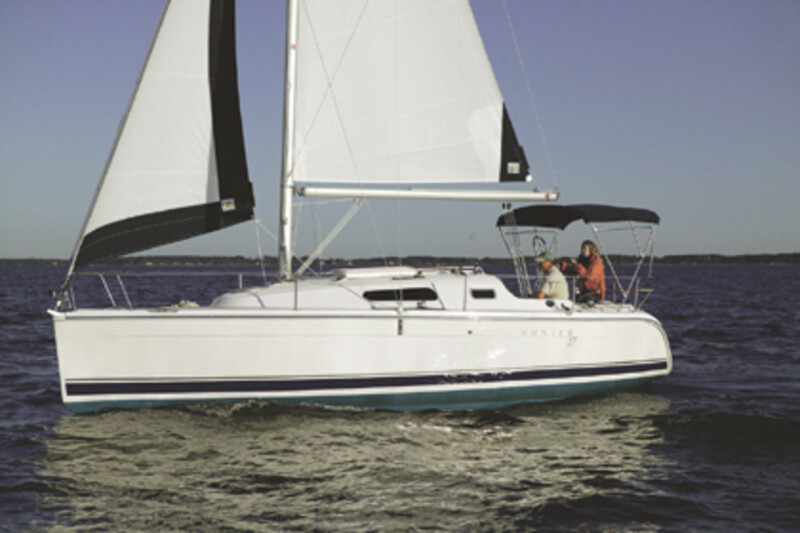 $47,500 (sailaway, FOB Alachua, FL). Hunter Marine, 386-462-3007, www.